Your pre-use risk assessment will determine if a spiderlift is the right equipment for tree work at height. Just as important as checking the suitability of the MEWP chosen for the task is checking the personal protective equipment (PPE) required by the operatives. Serious accidents do occur in arboreal and forestry work. 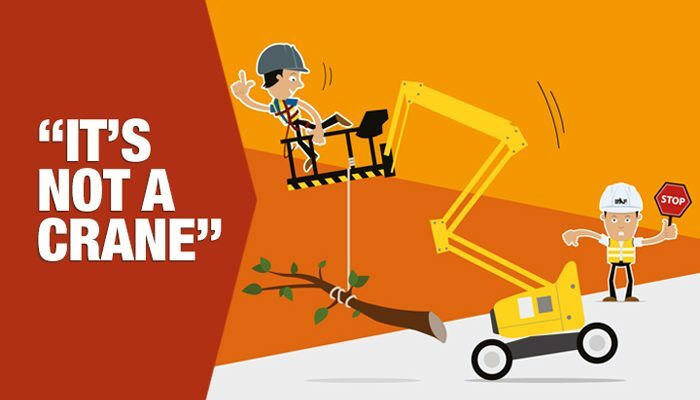 Tree work has a major incidence rate higher than the construction industry. Whether you own or hire a spiderlift, it is your responsibility to ensure staff are correctly trained and equipped. PPE for operatives using the basket but not a chainsaw should protect the head, feet, hands. Because of the inherent dangers of using a chainsaw whilst working at height, especially from flying sawdust and falling branches, protective equipment is essential. In addition to the head, feet and hands – eye, ear and leg protection are needed. • Protective boots need to be stronger with good grip, protective guarding at the upper front and instep, and comply with BS EN ISO 20345. Look out for the chainsaw logo. The wearing of Personal Protection Equipment by the tree-work gang is essential. Only trained and authorised people should operate the spiderlift. A spiderlift also requires minimum of two people to operate it and the ground staff must be able to operate the emergency controls on the platform below. Promax Access specialise in providing high access tree cutting equipment for the Forestry industry and tree cutting services. We can offer a wealth of advice on choosing the right access platform for the job. Contact us now. Just as the sailor keeps a “weather eye” on the wind, so must the MEWP operator and workforce. As part of the pre-work risk assessment it is important not to forget the possible effects of a change in wind speed. This is particularly so for those offering tree work. A powered access platform that works outside will operate up to a maximum wind speed that will have a mark on the machine or available in the hand manual. Operation above the maximum wind speed could cause instability and affect the safety of both operator and those below. As a guide, wind speeds above 28mph pose a safety risk making it uncomfortable and dangerous for the operator to continue to work. 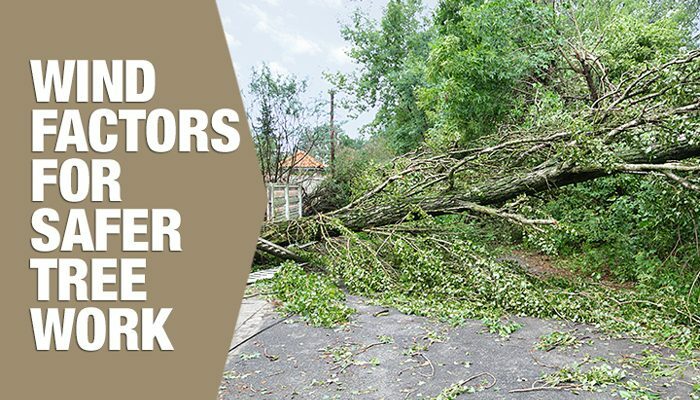 Other wind factors may also increase the risk of accidents during tree work. Wind chill has a serious impact on the ability to work safely at height. On a cool calm day with a temperature of 10 degrees C, it may feel comfortable enough. However, when the wind rises to 20mph the effect on the hands and face is to lower it to 0 degrees! If work was to begin at 0 degrees C on the ground and the wind become to rise to 20mph, then the effect on the skin comes -15 degrees C. Obviously it is important to wear very warm clothing at such temperatures. It should always be remembered that wind speed increases with height. At 20 metres above ground it could increase by 50%. The recommendation is that operators carry with them a hand held anemometer that they can quickly check at platform level. This essential piece of arborist equipment is available for less than £10 and measures wind speed, wind gust, wind chill and temperature. The anemometer comes with a lanyard for all powered access platform operators. 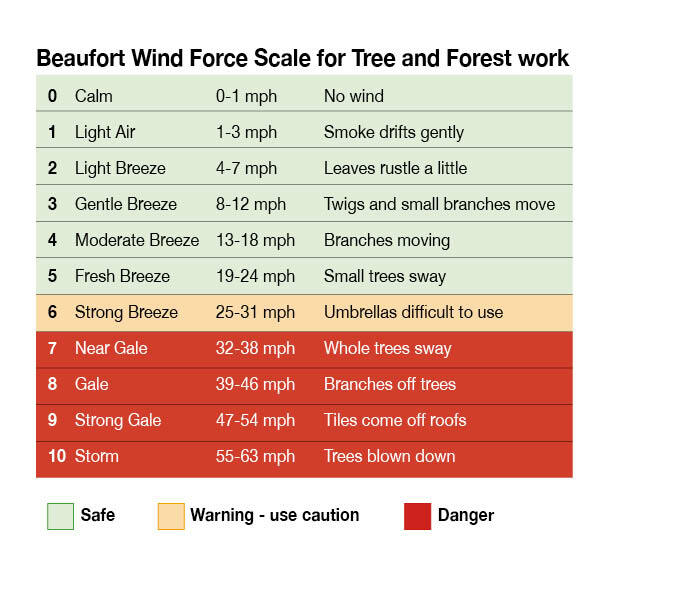 Always include wind speed in the pre-start risk assessment and monitor throughout the progress of the tree service. The hand held anemometer is a cheap practical tool for tree work when operating in the raised basket. A quick check will reduce the risk of instability and highlight freezing “wind chill” conditions. The value of trees to our environment is high on the agenda in managing our atmosphere. Often referred to as “the lungs of the planet” they absorb carbon dioxide and release oxygen; they stabilise soil by absorbing water; and provide a home for our wildlife. Careful management of this vital resource relies on expert tree surgeons and their tree cutting equipment. Some work can be done at ground level but much is done at height. As with all working at height, risks are involved and need to be carefully managed. The traditional climbing gear for arborists consists of ropes and ladders, these however carry considerable risks for the user. A much safer way to reduce the likelihood of an accident is by using a powered access platform. A “spider” platform is the perfect addition to any arborists tree cutting equipment. 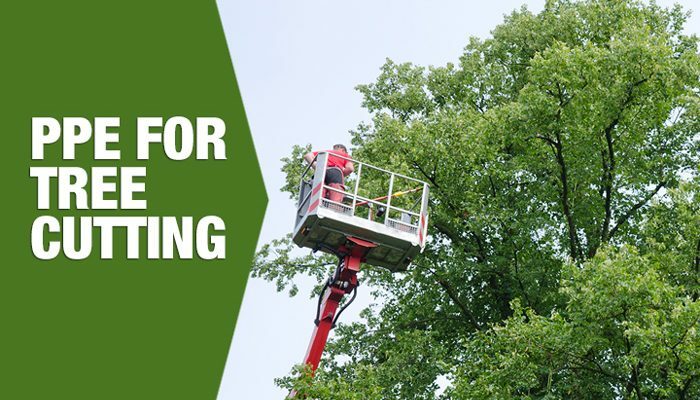 The HSE and The Arboricultural Association have both published guides and a code of practice for a safer working environment when working at height with trees. The key element is a risk framework that is properly planned, appropriately supervised and carried out in a safe manner. • Proficient operator – conduct the on-site appraisal on the day of working, validating and applying the safe systems of work identified by the competent person. Both the HSE and the Arboricultural Association highlight that before any tree work operations begin, a risk assessment must be made. They identify that using tree service equipment platforms, such as a Spider platform, lowers the risk of accident when compared with rope and ladder. The risk assessment will include a pre-work evaluation as to whether tree work at height is appropriate; a check that safe systems are in place; that operators are properly trained; identification of site-specific hazards; an emergency plan is in operation; and that everyone concerned has a clear idea of the tasks to be completed. Power access platforms are quicker and safer for arborists and are the perfect tree service equipment operating with versatility and flexibility in challenging locations. As with all work at height, a pre-work Risk Assessment is essential for the safety of all. Promax Access specialise in providing high access tree cutting equipment for the Forestry industry and can offer a wealth of advice on choosing the right access platform for the job. Contact us now. IT’S DOUBTFUL that the poet Robert Burns had a powered access platform in mind when he wrote “To a Mouse”. However, it is to the great Scottish Bard himself that we owe the phrase: “The best-laid plans of mice and men often go awry”. He wrote the poem after rescuing a mouse nest he had accidentally ploughed up. The observation is timeless and applies to all: No matter how a project is planned, accidents can happen. It’s also doubtful when MEWP rescue planning that the plight of a mouse will spring to mind. But perhaps what should, is a rescue plan in case the unexpected should happen. 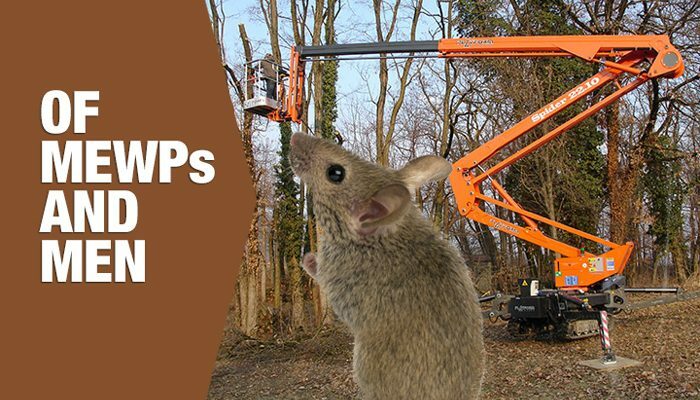 Not for a mouse of course, but for MEWP operators and workforce. As mentioned before, carrying out a detailed and thorough risk assessment of the job location will identify most of the potential hazards before the job starts, but sometimes human error or acts of nature, such as fast changing or extreme weather conditions, can mean that things still go wrong. It is important to have a rescue plan in place to support and assist the workforce in case of an accident or mechanical failure. Most access equipment has back-up systems built into the machine which enable the operator to return the raised platform back to ground level. Though these systems rarely fail it can still happen so it is vital to have a plan for how people can be brought down safely. Any MEWP rescue planning should comply with current health and safety legislation such as the 2005 Work at Height Regulations. It is important to do a risk assessment for the rescue and keep a record of this assessment and all details of the rescue as this may be important to refer to at a later date. In exceptional circumstances, where a basket-to-basket rescue is not feasible, emergency evacuation systems such as a crane rescue could be used. Having a rescue plan is an essential part of planning a job and, though access equipment is safe and efficient, there are rare occasions when jobs don’t go to plan. Carry out a full risk assessment, keep a record of any rescue situation as it happens, and try the simplest solution first before attempting a more complicated rescue procedure and the situation can be resolved quickly and carefully. MEWPs. Be extra careful in winter! Don’t get complacent in fast changing weather conditions. The mid-winter weather in the UK is always volatile. Conditions can change from sunshine to sleet and snow showers in a few hours. Conditions may be fine when starting a powered access platform job on a chilly but pleasant morning, but by lunchtime, they can quickly become treacherous. Winter MEWPS are not only designed to be safe and fully functional in bad winter weather but working in quickly changing conditions can increase the health and safety risks for workers and create additional access problems. Whether you are onsite or offsite, working at height requires a suitable risk assessment to avoid potential dangers. However, fast changing weather may require constant monitoring of the initial risk assessment. What was good at 8.00am may not be the same after lunch. Carrying out a risk assessment does not need to be overly complicated but it does need to be an important part of planning and completing a job. Both the supervisors and the staff should be aware of the potential dangers so they can actively avoid them. • Identify the Hazards – Walk round the site and make observations. Some of these may be obvious but it is worth getting a second opinion in case there is something you haven’t noticed. • Decide who might be harmed and how – It may be a job onsite or there may be safety concerns for the general public. Make sure staff are adequately trained to complete the work and briefed on the requirements of the job. • Evaluate the risks and decide on precautions – Avoid working at height where it is reasonably practicable to do so, for example can you get equipment or materials prepped at ground level? • Record your findings and implement them – Check the maintenance of the powered access platform and other equipment and make sure that workers know how to operate it safely and effectively. Take extra steps to prevent any person falling a distance that could cause personal injury and use equipment to minimise the distance and consequences of a fall if necessary, such as safety nets. • Review your assessment and update if necessary, not just at the start of a job, but hourly if neccessary. Circumstances change all the time so your assessment of the risks will too. Powered access platforms make working at height safer and quicker but they do not remove all the potential risks that changeable bad weather can bring. Constant monitoring of the risks will ensure that potential problems are managed and be prevented. Each job is different but the aim is the same: complete it without an incident or injury. The use of spreader plates with boom lifts and outriggers can save lives and minimise the risks of overturning and instability. 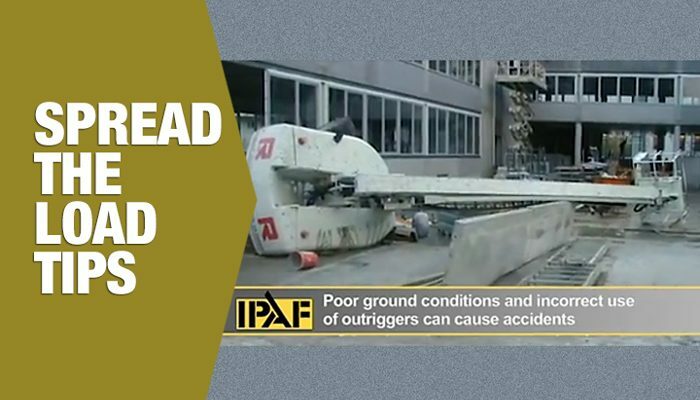 The IPAF ‘Spread the Load!’ campaign aims to encourage the use of spreader plates with powered access platforms and prevent accidents that are caused by inadequate risk assessments of unstable ground and incorrect set up of access equipment. Spreader plates reduce the heavy loads and pressure at the point of contact between a boom lift or stabilizer leg and the ground, by spreading the load through a wider area. When they are not used, the pressure can cause problems, even on seemingly stable ground surfaces, including instability, sinking or tipping over all of which can lead to serious injury and even death. This short four minute IPAF video demonstrates how using spreader plates reduces the risk of overturning. A typical 18m boom can weigh more than 10 tonnes and generate a ground bearing pressure more than 14.06kg/cm. If the spreader plate is just twice the size of the outrigger foot, it can reduce the ground pressure by four times. Risk assessments for jobs at height need to consider ground conditions and potential issues below the surface such as services. However, it can be hard to tell how solid the ground is as conditions can change with the weather and can vary even on the same site. • The plates can be made from timber, aluminium or various plastics and resins. • Varied ground and weather conditions mean even jobs on the same site may need different plates. In most conditions, MEWPs are very safe and stable. However, instability and overturning may result from inadequate ground assessment, poor selection of spreader plates, or incorrect positioning of outriggers. Choosing the right spreader plates can significantly reduce the risk of accidents. Whilst power access platforms are designed to be strong and stable on a wide range of floors and spaces, whether on or offsite, the most common type of accident involving powered access platforms is still overturning. With due care and attention these dangerous and expensive incidents may be avoided. There are two main factors which can prevent stability problems: a basic understanding of stabilising equipment properly and carefully assessing the surface they are used on. Ground conditions have a big impact on the stability of MEWPs and a ground survey should be completed before every job. The ground may settle when subjected to the loads of MEWP wheels or outriggers. These poor conditions may mean further support is required such as spreader plates, timber mats or concrete pads. Ground condition assessment is also important for self propelled MWEPs such as booms and scissor lifts which may be driven along the ground with the platform raised. Moving from hard ground to soft may cause instability and overturn. Level indicators provided on the MEWPs should be constantly monitored by the operator. If warnings are given when safe operating limits are exceeded, the platform should be lowered and the MEWP reset in a level position. Spider platforms with outriggers should also be regularly checked for machine level especially if suspected that spreaders or mats may be sinking. Prior to using a high access MEWP a visual inspection and assessment of ground conditions are often adequate (as opposed to having a full geotechnical survey). This assessment must be made by a person with the knowledge and experience to know if further expert advice is needed. 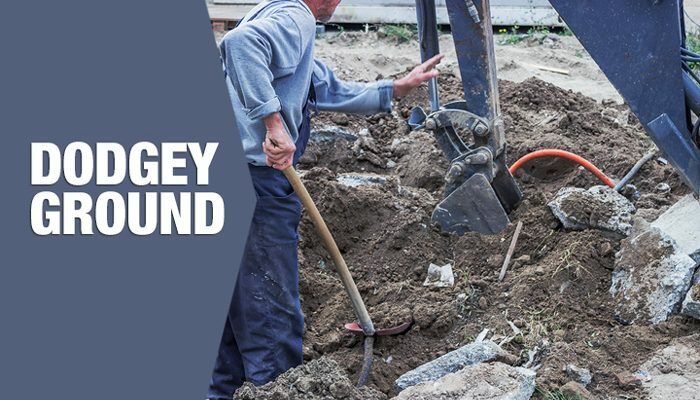 • Proximity to Excavations – If the MEWP needs to be used close to the edge of trenches or excavations where the outriggers or wheels may be in the “danger area”, then an engineering assessment must be made by a competent geotechnical engineer before the MEWP is set up and operated. • Floors, Cellars, and Basements – Check the load bearing. Many floors are unable to take the weight of a MEWP and could collapse without warning. If in doubt get a geotechnical engineering assessment made. • Paved Areas – May look strong but could have been laid on weak ground. Look for cracks and uneven slabs. Footpaths should be considered suspect and carefully checked. • Underground Services – The weight of a MEWP may cause damage to sewers, drains, manholes and gas and water mains. Use caution. 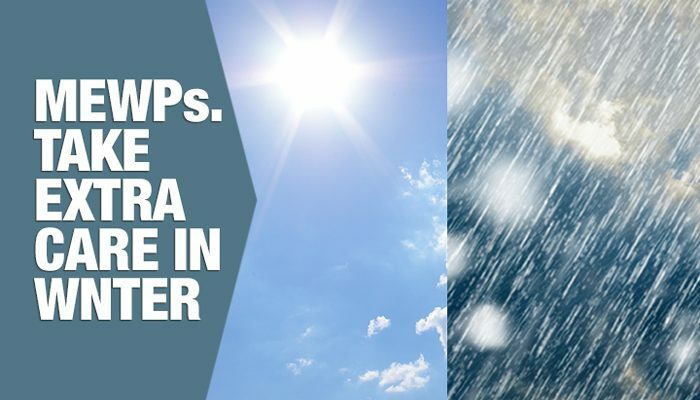 • Weather Conditions – Regular checks need to be carried out if the ground is suspected of getting softer. Heavy rain and frozen ground thawing out can have adverse effects on MEWP stability. MEWPs can be stabilised and perform safely and effectively on most surfaces and gradients provided a few basic things are taken into consideration. Get familiar with the machine’s warning devices and what it is capable of doing. Assess the ground conditions that you are working on to ensure you can use the machine to its optimum performance to help prevent avoidable stability accidents. With the new year coming up soon. now is a good time to reflect on the past year and your training program for using powered access platforms. Both employers and individual users are liable if the people in charge of the machinery are not properly trained. Training on MEWPs can make working at height safer, quicker and more efficient but it should be remembered that operators need a PAL card and this needs to be renewed every 5 years. Are all log books up to date? Is a refresher course needed? If your future job plans mean working in higher risk or challenging environments your operators may need a PAL+ card. Special training is available, for example, for working in confined overhead spaces or on challenging terrain. There are courses for managers who are responsible for planning, supervising and effectively managing the use of powered access equipment. This is not about operating the machines per se, it’s about health and safety regulations, accident prevention and control, protective equipment and pre-use checks and maintenance schedules. All levels of management would benefit from this type of training. This includes project managers, foremen and supervisors working in a broad range of industries such as construction, facilities management, retail, airports and arboriculture. Who needs training on MEWPs? Employers and individual users must make sure operators are properly trained. Rental companies are also obliged to direct their clients to appropriate training if they don’t deliver it themselves. Accredited training centres are located across the country and courses can be held at their premises, or on a convenient site with suitable facilities. • Understanding issues associated with larger machines: e.g. outriggers/stabilizers, extendable axles and envelope management systems. IPAF the aerial work platform industry professionals have recently developed an online eLearning training course for operators. This new enhanced eLearning module is part of IPAF’s full training programme for operators of mobile elevating work platforms (MEWPs). The eLearning module delivers flexibility and interactive tools, with the same emphasis on practical training. Operator eLearning does not replace practical training. 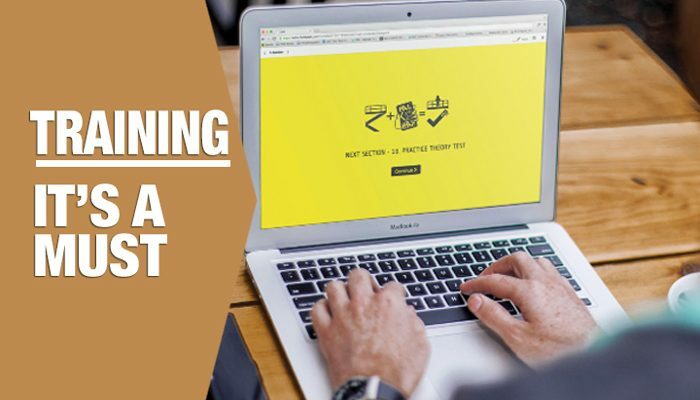 Trainees who complete the online session must still pass a supervised theory test at an IPAF approved training centre and must successfully complete a minimum half-day of practical training and testing. Powered access platforms have many benefits for working at height but there is a legal obligation to make sure they are used safely and properly. Training staff is not only a legal requirement but jobs can be completed more efficiently if everyone involved knows how to use the equipment properly and dangerous and costly accidents are avoided. IT’S A MEWP – NOT A CRANE! Using MEWPs for working at height is one of the safest ways to reach those elevated areas to get vital work done. At this time of year power access platforms are doing their bit to bring festive cheer to brighten our day. Public spaces, malls and shops all rely on MEWPs to get the Christmas trees, decorations and lights in place all adding to the Season’s cheer. The IPAF accident reporting project has identified a number of valuable learning outcomes and as a result, are reinforcing the key messages with a series of posters featuring the characters “Andy Access” and “Hugh Hazard”. These are available from www.ipaf.org/AndyAccess. Using a MEWP as a crane may seem a quick, convenient idea but it is highly dangerous. As the IPAF poster reiterates “MEWPs are designed to elevate people, tools and equipment inside the work platform”. Using powered access platforms as a crane can easily tip the platform over creating a danger both for the occupant and the those on the ground. Before the job begins a site survey and risk assessment will determine if a crane is needed. 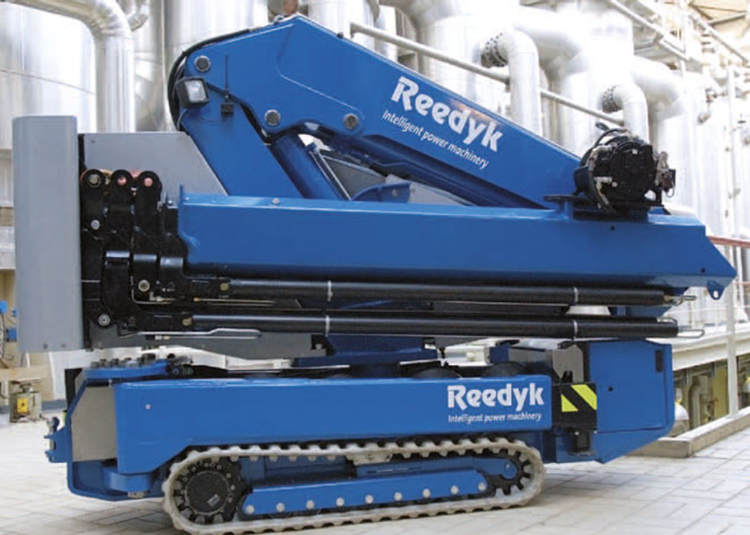 If access is difficult with height and width restrictions, a compact crane like the Reedyk – C3410 is perfect. Thanks to the strong non-marking rubber tracks the crane has a zero turning radius. The Crane travel is radio controlled, allowing it to pass through a gap of only 1m wide. It can lift up to 3,840kg with a working height of 16m. It can also pick and carry up to 1,000kg. 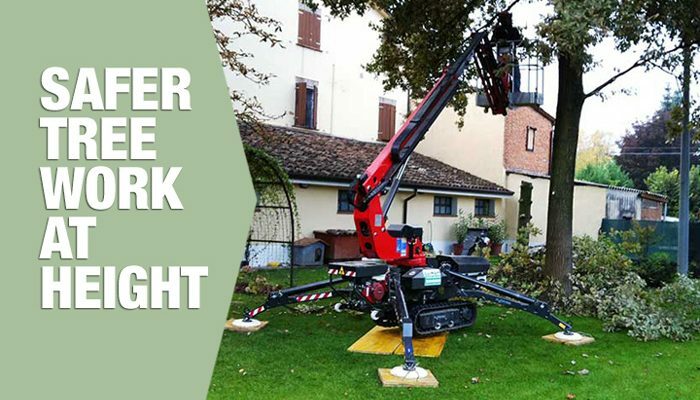 The compact crane and a compact powered access platform are the perfect partners to safely tackle those difficult to reach places where access is restricted. Choosing the right equipment for the job, proper training and good risk assessment are essential to help reduce accidents in the industry. It’s that time of year again! The festive season has arrived amidst a festoon of decorations hanging in all the shops. Wander through the malls and you can’t help but be impressed with the magnificence of the hanging decorations. Suspended as if by magic they are of course the result of careful planning and specialist working at height equipment. Operating MEWPS indoors poses a number of challenges for the teams involved. Operating MEWPS indoors can add to the usual safety concerns for the workforce. It can be complicated to get the MEWPS indoors to the work area, let alone set it up and start using it. MEWPS often need to be transported through a tight space and set up, taking care not to damage the surrounding environment and making sure the machine is fully operational and safe despite these additional limitations. Our MEWPS have been specially designed to work indoors. They provide maximum functionality both indoors, and in tight spaces. Sometimes referred to as spider lifts, the name comes from the shape of the stabilizer legs. These legs fold up to enable the lift to be used in narrow spaces. They will pass through standard width doorways or gateways which would be problematic for other types of lift. 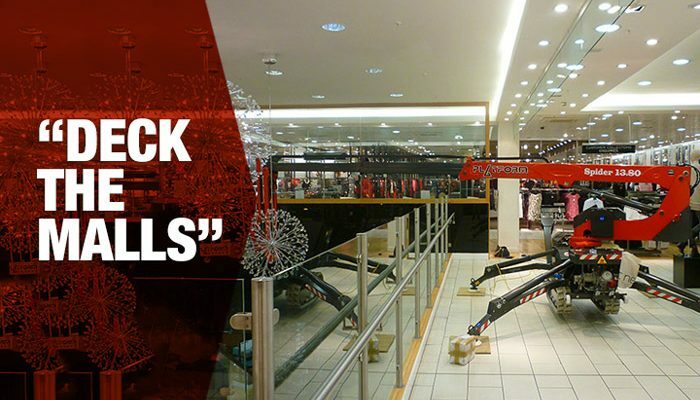 This clever design does not mean a compromise on the overall functionality of the lift as they are still able to safely reach significant heights, and have strength and stability on the Mall floors. They have a number of features which make them particularly useful for jobs indoors or in more delicate areas. • A tracked chassis to spread the weight of the lift over a larger area and reduce the ground bearing pressure, preventing damage to fragile floors or pathways. • Electric motor power option for indoor use which reduces operational noise with no exhaust fumes. • Lower overall weight than other types of lift but with no reduced functionality. • Easy to transport as most are road towable. • Radio control options for use in tight space. Due to their narrow design and low ground pressure make our MEWPS flexible and reliable on delicate surfaces. The spider-like legs can even be set up in different positions on different ground levels (for example steps or platforms). This means our MEWPS can be used in compact spaces where other lifts are unable to work. MEWPS are the least disruptive type of powered access platform. They are not only flexible, but also adaptable for a range of unique and specific jobs. They have reduced noise, flexible access and can be used on most surfaces without compromising safety or functionality. MEWPS do not cause damage to more delicate surfaces, even in the most unusual spaces.